Yields glossy, incredibly sweet, medium to large-sized fruit with firm, thirst-quenching flesh. Its natural sweetness makes it an excellent variety to eat fresh, and its perfect for making jam. 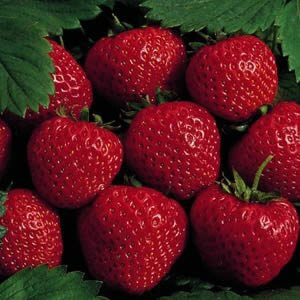 All our 'Earliglow' Strawberry Plants are organically grown and shipped in fine quality growing medium. They are guaranteed to arrive alive and ready to plant. Comment: I’ve ordered a few different types of plants by now and they always come healthy and take to the soil well and the strawberries are no exception! I love how growjoy sends me updates on when is best put plants into the soil or I’d have no idea where to begin. Comment: Quick delivery. Love the plant. Comment: STARTED GROWING NEXT DAY THEY WERE PLANTED! Comment: Earliglow plants arrived at the perfect time. They were healthy and came with thorough instructions for planting. So far they are thriving in our garden. Comment: My Earliglow plants arrived in excellent shape. The root systems are better than any I ever ordered from others. Instructions were easy & the plants, now potted, are growing beautifully. Comment: My strawberry plants arrived healthy and packed safely. They are doing great! There are runners off every plant and flowers on every mother. I cannot wait until next year's harvest. Great service, great plants!